Last month I was in London once more. One of my goals for the trip was Antiques Textiles Company in Hampstead, Christopher Wilson-Tate's wonderful shop. 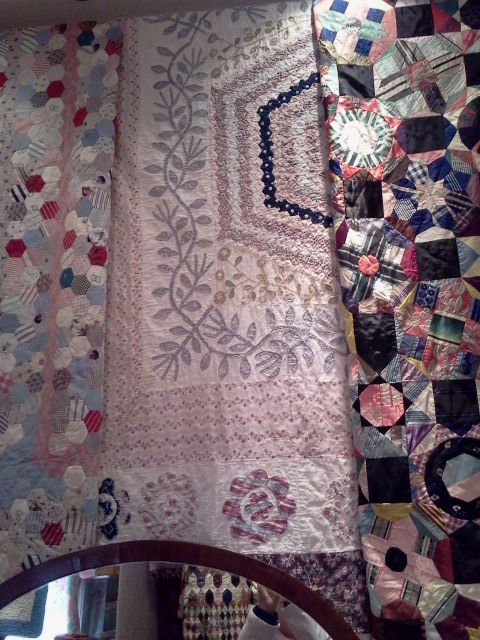 A few times I almost welled up a bit - in two small rooms were shelves from floor to ceiling filled with fantastic quilts. Many were two hundred years old - from the Georgian (THE George III) era. Anyone interested in beautiful textiles could spend many moments in awe here. After an hour or so of interesting and enlightening chat with the nice owner, I headed off into the streets of London filled with impressions that will last a long time. Please visit their website, if you cannot visit in person. You're in for a treat! More pictures of this treasure trove can be seen at their Fb-site here. Kathy visited some time ago, see her pics here. Some parts are very fragile. 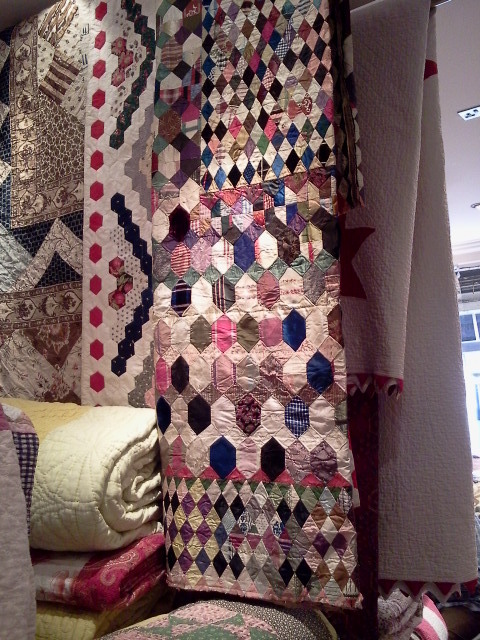 To me this is part of the quilts' history. Pattern no. 272, Endless Wheel, according to Barbara Brackmans Encyclopedia. 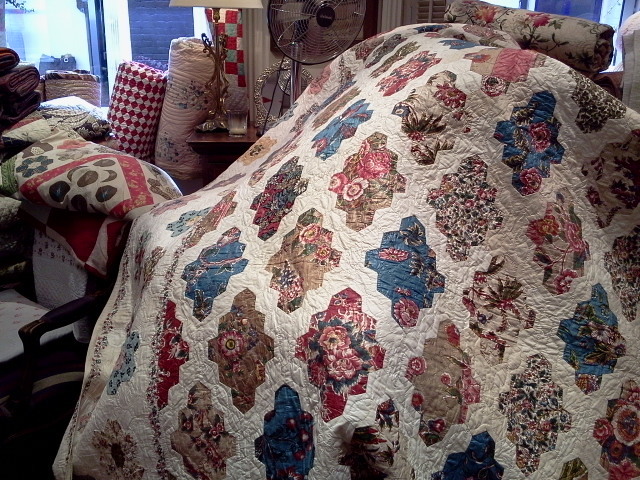 This quilt makes me think of a flower meadow. I love the variety of patterns in the fabrics. When visiting with my husband's ucle and aunt in Sweden, his aunt showed me these two quilts. They were stored on top of her guest room cupboard. She told me they were made by a member of the Bulmer family in the Fenelon Falls area in Canada. My DH's aunt and uncle were the Bulmer family's neighbours for about 20 years before moving back to Sweden. When she gave the quilts to my husbands aunt (ca. 2004), Marie Bulmer was in her eighties. She told my DH's aunt that the family had been poor, and that her mother-in-law had made the quilts. 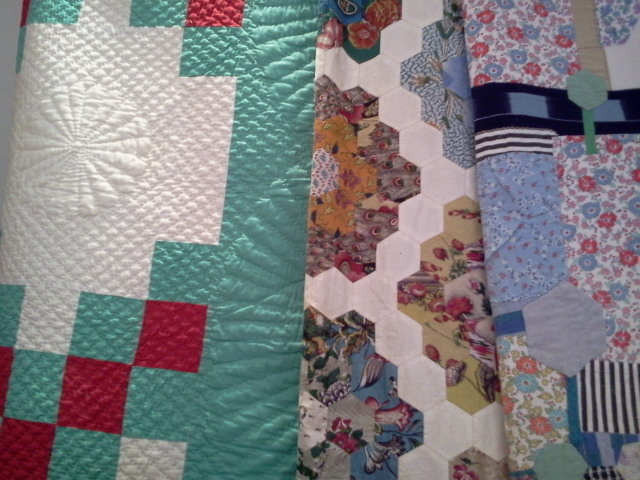 I very rarely see old quilts hands on, so to speak. When I told our relative that these quilts represent something I love, she promptly said that she wanted me to have them. I was lost for words and wanted to jump up and down for joy. They are incredibly soft from wear. Some places in both quilts are more than worn out. And I love them still. Now they reside in our living room, on top of my grandmother's cupboard that I inherited from her. When it comes to how old they are, I am not sure. My unprofessional guess is that the Violet's Dream quilt is the oldest. The sashing of said quilt is the same as the backing of the Endless Wheel quilt. Probably there was fabrics left over from the first quilt. I have a theory that they are made by different members of the Bulmer family. To my eye the quilting in the one I presume is the oldest, is finer than in the more colourful one. Maybe the first was made by a mother, and the latter by a daughter. I am guessing that the Endless Wheel quilt is from the 1930's to 1950's and the oldest from 1910-1920. I would love to hear opinions on this. Thanks for stopping by and listening to my ramblings. Take care. Our teapot needed a home. Made after instructions in this book by Suzuko Koseki. A few years ago I learned to hand quilt in a new way. Before this I had always (since the mid-nineties) used the rocking motion to quilt. Then I stumbled across a video by Jean Brown. She showed how she quilts. I had to give it a try. The bent metal plate is kept under the quilt, protecting your finger as you push the needle back up again. (The pic above shows the back of the quilt shown in the first pic) I suppose this method is related to spoon quilting, which I have yet to try. In the beginning, learning to quilt this way I felt like a beginner again. Some hours learning again had to be invested. I find it was worth it. Being able to quilt for a considerably longer time at a time, without pain and fingers with calluses, I find amazing. Also I like my stitches, and think they show better on the back of my quilts. Another great plus is that it is not exaggerated to say that the quilting is more time efficient. I love the process of quilting, and do not care if things take a long time, but quilting this way allows me to handle more UFOs. Jean Brown's demonstration of the technique can be found here. I appreciate that we all have our own preferred methods. This is just one happy quilter's ramblings... And I do not know Jean Brown, but I am grateful to her for showing a great way of avoiding sore fingers when I get to do what gives me much pleasure. If I had had the time for more quilting, I might have kept the white border. These borders are there to ease quilting in a frame. But alas, there was no time - the gift had to be finished before a sewing appointment. I learned from a dear friend how to make ginger, lemon and honey tea. It has been a good summer - despite the mourning process we all have gone through after happenings in the Oslo area on July 22nd. We were not personally affected by the tragedy, but we were nonetheless nummed by the evil nature of the events. Now regular schedules have resumed, and we are preparing for autumn activities and winter journeying. In March I put in the last quilting stitches on this project that has been undergoing a process for about thirteen years. A few days ago sewing down the binding was almost done too. It is a strange feeling, ending a process. It is almost like saying farewell to a friend. My pretentious working title for this quilt was 'Winds form the east'. My husband is Swedish, and I started making this when we had just met. It is a leftover quilt - made from fabrics after the making of this one. I like the back too. After it was finished I threw it in the washer, and I find that the cotton batting has worked its wonders nicely. 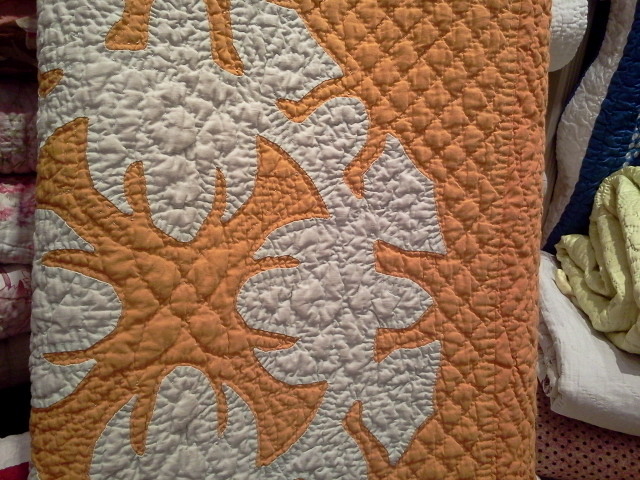 The windmill blocks are quilted with lines half an inch apart. When I started working on the borders - oh, the initial woes of choosing patterns for borders - I decided I wanted to keep working in 'half inches' The pattern I landed on, so to speak, was one similar to the orange peel pattern. I outlined the peel shapes, and quilted free hand around them. As I progressed, the half inch increment narrowed down to a 'scant' quarter inch. In a way the quilting took over and started living its own life. Choosing border, backing and binding fabrics I had good help from Trine Bakke at my favorite local quilt shop, Lappemakeriet. Good help was also given by a dear friend, who helped me baste it before quilting. To my 'horror' I discovered my backing was not large enough. Looking through my friend's scrap basket we discovered backing fabrics from a quilt she then recently had finished. It was perfect for this backing, seen in the pic above to the right. Hand pieced, hand quilted. All cotton, fabrics, batting and thread. Corner block - one of my favorites. Looking at this quilt, I see my color preferences have gone through some changes over the last decade or more, but the fabrics and colors in this block I could have picked out yesterday... See you. Two blocks - same pattern, inspired by the George coverlet at the V&A. When I drafted the pattern, I did not care too much for the center, so I made a twist of my own - a star. While I was at it, I made another with a different mood. Two sisters - same origin, but different. I have not yet made a smaller version of this pattern. Finally, a week ago, our cherry trees were in bloom - now the surrounding ground is covered in white petals. Now our apple trees are in full pinkish bloom - spring is exploding before our eyes.